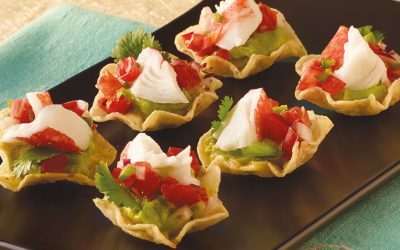 Try Wonton Cups with Baked Seafood for your next potluck or dinner party. 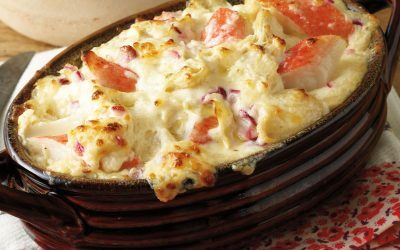 This crowd-pleasing appetizer takes only 10 minutes to prepare and is sure to leave a lasting impression. Spray both sides of the wonton wrapper with cooking spray or brush with oil and fit into muffin pans. Top with another muffin pan or some baking beans to keep the muffin shape. Bake 7-8 minutes or until edges are beginning to brown. While wonton skins are baking combine cream cheese, Crab Delights®, Old Bay and half the green onions. Season with salt and pepper. Remove the top muffin pans or baking beans. Divide the filling between all the wonton cups and bake an additional 10 minutes. Sprinkle with the remaining scallions and serve warm.